Michael played 154 games for the University Football Club. He played in his first premiership in 1974 in the A Colts competition. 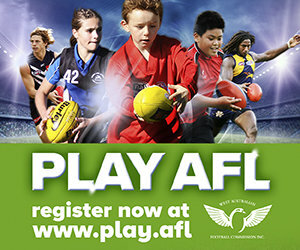 In 1975 Michael played in University’s A Grade premiership and was selected in the state amateur representative team. In the same year he won the A Grade leading goal kicking award with 103 goals for the season. He went on to play in University’s A Grade premierships in 1975 and 1977. He also travelled to Adelaide in 1978 to compete in the State WAAFL Team before being picked up by WAFL club Claremont in 1979. Between 1979 and 1980 Michael played in Claremont’s league and reserves side including the Claremont Reserves premiership in 1980. 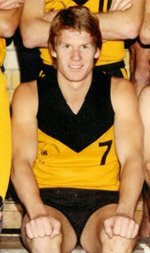 He returned to the University Football Club in 1981 where he played and coached the A Grade side to another premiership while being selected as Vice-Captain in the state amateur representative team and winning the inaugural B.J Giles Medal as the best player in the A Grade Grand Final. He again coached the University team in 1982 and was selected as Captain of the All Australian Amateur Team following the carnival held in Perth. He was also selected as vice-captain of the all Australian team that played Vic Country in 1983. In 1985 Michael was selected as Vice-Captain in University’s Best 25 Year Team. In 1986 he played in University’s F Grade Premiership as well as their I Grade premiership in 1988. Michael Salmon finished with six premiership medals with three of those in A Grade. He was a four-time State Amateur Representative as well as being selected twice in the All Australian Amateur Team, once as Captain and once as Vice-Captain. He was the inaugural chairman of the metropolitan football league council serving from 1996 to 2002. The WAAFL inducts Michael Salmon into the Hall of Champions as a Champion.